Snakes can make interesting and unique pets, but which species is right for you? The best snake pets are easy to care for, requiring infrequent feeding and cleaning. Any of these good pet snakes could be an appropriate pet for a child as long as an adult supervises the care, and the child can understand that snakes have to eat other whole animals. Choosing the right snake for your interest and experience will help ensure that you and your pet will be happy for years to come. The corn snake is one of the most popular snake pets and is a great choice for beginners as well as experienced herp keepers. According to The Corn Snake.co.uk, this species makes a great pet because they have a docile temperament, are easy to care for, are attractive and interesting, have few health problems, and can live 15 to 20 years. Corn snakes are available in a variety of color patterns. A snake with the classic color morph is red-orange, with black markings, and is known as a Carolina. All About Corn Snakes shows the great variety of colors available for corn snakes, including white, gray, pink, yellow, and other shades of orange. Some types have bands of color while others will have stripes that run the length of their body. Corn snakes reach four to six feet in length as adults. According to the Maryland Zoo, corn snakes are native to the eastern United States. Their range extends from New Jersey to Florida, and west to Louisiana. In captivity, Reptiles Magazine recommends housing a corn snake in at least a 20-gallon aquarium. They are solitary animals and should not be housed with other snakes. No special lighting is needed, but they do require a temperature gradient with a hot spot of 85°F at one end. The bottom of the cage can be lined with non-aromatic shavings, newspaper, or a reptile carpet. 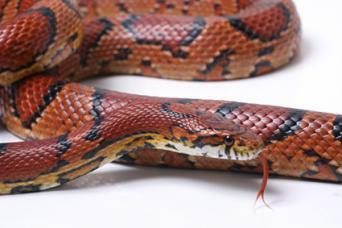 Corn snakes eat rodents, from newborn mice to large mice or even rats for adults. The prey should be chosen to be as wide as one and a half times the snake's head. Avoid feeding your snake live rodents because they bite and injure your snake. Young corn snakes only need to eat every five to six days, and adults, every seven to ten days. The common kingsnake is a great starter snake. Kingsnakes are good pets because they are easy to care for, have calm temperaments, are inexpensive, and are available in a variety of colors. 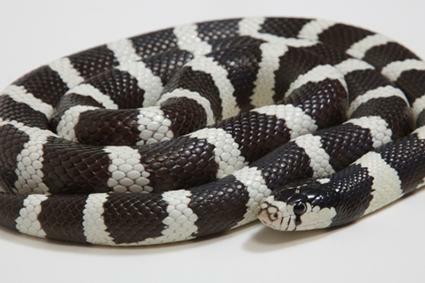 The common kingsnake is black with a pattern of white chain-like bands along its body. Several color morphs and subspecies are available and different names exist for snakes with these color patterns. Their natural range is similar to that of the corn snake. They reach anywhere from three to six feet in length when fully grown. Petco recommends that this pet be kept in an enclosure appropriate for its size, approximately 15 to 20 gallons. Use aspen shavings, coconut fiber bedding, or reptile bark to line the cage. Kingsnakes require a temperature gradient from 78 to 95°F and a humidity of 40 to 60 percent. As with corn snakes, individual kingsnakes or several species of snake should not be housed together. In the wild, kingsnakes are known to eat other snakes, even venomous species. In captivity they should be fed mice. Reptiles Magazine recommends feeding your king snake about once a week. 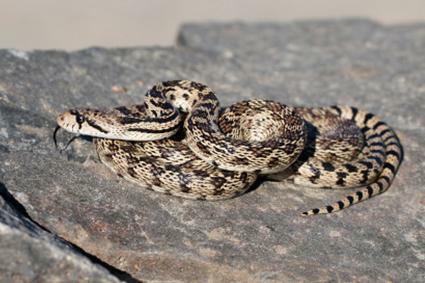 According to Reptiles Magazine, gopher snakes make good pets because they can be handled frequently. They also do not tend to coil around your arms like many other species. This snake is native to the western United States and parts of western Canada and Mexico. Gopher snakes can grow to be as long as nine feet, but more commonly only reach four feet. The Arizona-Sonora Desert Museum reports that gopher snakes are yellow or tan, with blotches of dark red or brown over their backs. Their scales appear rougher than those of other snakes, and some people will mistake them for rattlesnakes due to their coloring. Since gopher snakes are often larger than corn snakes or kingsnakes, they may need a more spacious enclosure, such as a 30-gallon aquarium. The Long Island Herpetological Society states that the cage should be lined with newspaper, paper towels, or aspen or pine shavings. No special lighting is required, but a supplemental heat source should be provided to produce a range from 75 to 85°F. Gopher snakes also need a hiding place which can be either a box, or plastic or rock "cave." The Long Island Herpetological Society notes that gopher snakes eat rodents, and usually need to be fed once to twice a week, depending on whether they are growing or not. Milk snakes are very similar to kingsnakes and share some of their attributes. They are sometimes called scarlet kingsnakes. According to ReptileKnowledge.com, they make good pets for some of the same reasons as the kingsnake, but also because they are brilliantly colored, beautiful snakes. Several subspecies of milk snake can be found, all with a pattern of alternating red to brown and white to yellow bands, separated with black. Milk snakes grow to a length of four to five feet. The most brightly colored subspecies of milk snake can be easily confused with the venomous coral snake. 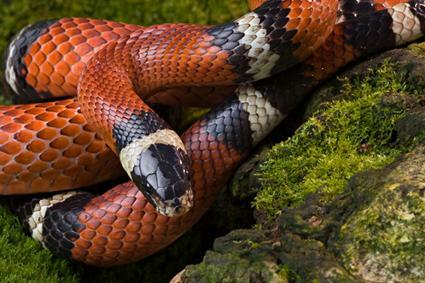 The phrase "red touch black, venom lack" can be used to describe the banding on a milk snake to distinguish it from the coral snake's "red and yellow, kill a fellow." The harmless milk snake has adjacent red and black bands while the coral snake's red and yellow bands are beside each other. Big Apple Pet Supply notes baby milk snakes can live in an enclosure that is as small as ten gallons, but adult milk snakes will need a habitat that is 20 to 70 gallons. Use aspen shavings, coconut fiber bedding, or reptile bark to line the cage, and use an external heat source to provide a temperature gradient from 78 to 95°F and a humidity of 40 to 60 percent. According to VMSHerp.com, milk snakes should be fed mice appropriate for their size. Hatchlings will need to eat every five to seven days, and an adult milk snake needs a meal every ten to fourteen days. Rat snakes are closely related to corn snakes, and share many of the characteristics that make the corn snake a good pet. A rat snake is a good pet because it is active during the day, has a docile temperament, and is easy and safe to handle. 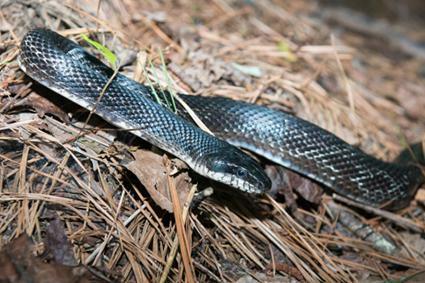 The Savannah River Ecology Laboratory reports rat snakes are found across a large area of the eastern and southern United States. They typically reach three to five feet in length and can be found in a variety of color patterns. The most common subspecies are uniformly gray to black, or have a lighter underside with stripes of brown or gray over a yellow or tan body. As with other snakes of this size, a rat snake can be kept in a 20-gallon aquarium with a substrate of mulch, paper towels, or newspaper. According to ThatPetPlace.com, the cage temperature should be kept at 75 to 82°F, with a basking area of 88 to 90°F. Rat snakes will hide in a box or artificial cave if that is provided, and fresh water should always be available. According to ThatPetPlace.com, rat snakes eat mice and other rodents. Generally, they can be fed one mouse once a week. Juvenile snakes may be fed more often to promote faster growth. Garter snakes are great for beginning snake enthusiasts. It is active, easy to handle, easy to tame, and they stay relatively small. They are also inexpensive and easy to maintain. According to Utah Veterinary Clinics, wild garter snakes prefer to live in moist environments, near a pond or other source of water. Several different subspecies of garter snake exist, but in general, they are small, thin snakes, reaching three to four feet in length when full grown. Most types are patterned with black and yellow stripes. Herp enthusiast Jonathan Crowe recommends that a garter snake be kept in an aquarium from five to fifteen gallons in size, depending on the age and size of the snake. While wild garter snakes prefer habitat near water, a captive snake should not be kept in an overly wet or humid environment. A large water bowl should be provided, large enough to allow the snake to swim in it. The cage can be lined with paper towels, a reptile carpet, aspen shavings, or cypress mulch. Garter snakes can eat a variety of small prey items, including fish, worms, and small mice. Feeder guppiesor platies can be placed into the water bowl for your snake to find. If your snake will not eat mice, the diet should be varied to include whole fish, pieces of fish fillet, earthworms, and pinky mice parts. 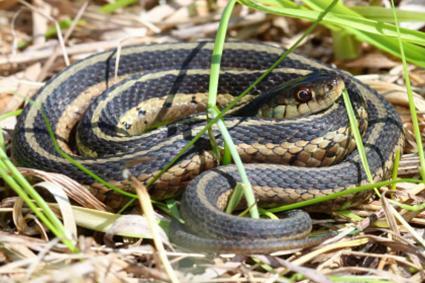 If a garter snake will only eat worms, then you'll need to supplement his diet with calcium. For those snakes that eat fish, avoid goldfish and certain other species that contain a dangerous enzyme called thiaminase. 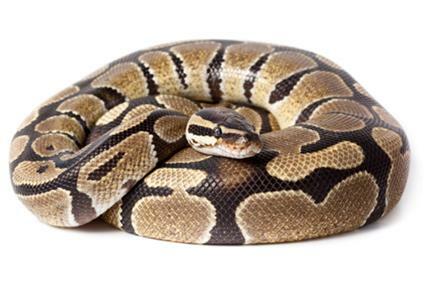 While it may sound exciting to keep a very exotic species of snake, many of these are not suitable as pets. One type of snake that can look more exotic, but still makes a good pet is the ball python. This species is easy to care for, stays relatively small, and is docile when handled. According to the University of Michigan Museum of Zoology, ball pythons are native to west and central Africa. These are heavy bodied snakes and can grow to reach three to six feet in length. Ball pythons are mottled in a pattern of light and dark brown to red-brown, and their undersides are white. Ball pythons can be kept in an aquarium from 20 to 30 gallons in size. A hatchling can start out in a 10-gallon aquarium. The enclosure should be lined with paper towels, a reptile carpet, or shredded cypress or fir bark. The temperature needs to be kept at 80 to 85°F, with a basking area of 90°F. At night, the temperature can decrease to 73 to 75°F, with the basking area at 80°F. Ball pythons can have a reputation as picky eaters, but this can be a normal attribute for the species. The World of Ball Pythons reports that these snakes are binge feeders, eating well for a few weeks or months, and then refusing food. They eat mice and rats, and the food can be varied if the snake is not eating well. Make sure that the housing requirements are being met, and that the snake is left undisturbed with its food. If your ball python still refuses to eat, it may be suffering from stress, nearing a shed, or have come down with a disease. If you select carefully, you will certainly have a great pet snake for several years to come. With minimal day-to-day care required, snakes are some of the easiest and most interesting pets out there.